It seems like this year the show formerly know as Hip-Hop is being stolen away by the state of Michigan (Detroit area specifically). So far this year we have seen new albums from Guilty Simpson, 14KT, Buff1, two incredible albums from Elzhi and now we are privileged enough to receive Tronic with open arms. 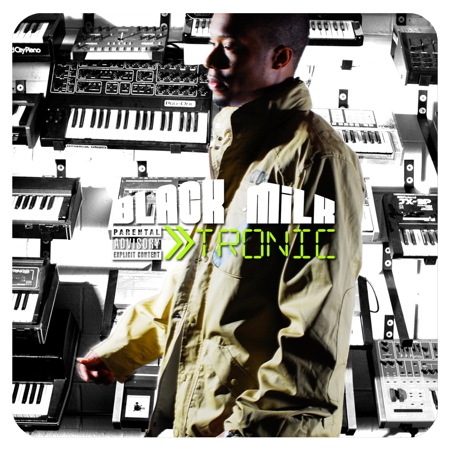 Last year Black Milk released Popular Demand to critical acclaim as a self producing emcee. I have to admit that it was one of my favorite albums of last year, and Tronic is definitely one of my favorites this year. Black Milk is one of those guys that just drops my jaw every time that I hear something new of his because it’s like nothing I’ve ever heard before, I hate to compare him to Dilla (because there is no comparison) but Milk is taking it to that level very rapidly. I have to say that this album had me from the beginning track “Long Story Short”. I was completely blown away by the elements of this track. It starts out with an almost “futuristic” synthesizer sound and fades to a beautiful piano melody. What comes next is a beat the hit me like a ton of bricks, it was so hard it almost made me cry. The incredible thing about the track is it literally is a long story short, it’s Black’s entire life up to this point in time and he tells his fable like Aesop. “Losing Out”, which is a track that features crafty veteran fire spitting Royce Da 5’9″, is another great track because the beat is lights out (particularly the sample) and Black and Royce exchange some straight butter verses. Black is very good on his verses but Royce holds his own as well and outshines Black a little. The only real conclusion comes out of Royce’s mouth in his last 8 bars: “I’m talking bout how we got it mastered, the fact is whenever me and Black do a track it’s a classic!” Detroit native Fat Ray (who earlier this year released an album with Black Milk titled The Set Up) joins Black on the hook for the track “Hell Yeah” which has a ridiculously hard beat, and some vicious flows from Black: “The whole world’s been patiently waitin’ for my comin’ to strike, patiently waitin’ like the second comin’ of Christ”. The track that most people would call the highlight of Tronic, “The Matrix“, which features the legendary DJ Premier, Pharoahe Monch, and Sean Price is a straight classic and Pharoahe Monch absolutely kills this track: “Four finger ring rap sling slang Pharoahe the flows good/You couldn’t hang if you was Ving Rhames in Rosewood” “…Like the pant legs around the ankles of hipsters, I’m tight/Paint a more visual picture than Pixar…”. Black spits a great tongue twisting verse, and Sean Price never made gangs seem so interesting with his word usage: “I’m a kryptonite, but a blood today, Latin King tomorrow…”. The cuts on the album are done by Premier, and he never made it seem so effortless: “You love my style cuz’ I’m not what you used to, caught in the matrix… you’re in my danger field like Rodney”. I think that the track “Reppin’ For You” might be the highlight of the album for me. It has a great head noddin’ beat and Black’s flow to this track is lights out: “Every single line was written explodin’ like bombs droppin’/It’s like I’m Bin Laden when my pen’s jottin/The best to most with extra votes/A flow that’ll shock most like electric volts”. All in all this is a great album and should be a indication of how great the Hip-Hop scene in Detroit really is. There are a few tracks that drag a little bit, but not enough to give this album anywhere near an average or below average review. Black Milk could hold up the city of Detroit on his shoulders, and chances are he probably will sooner than later with efforts like his last two. Tronic shows you what the definition of a producing/emcee should be. This entry was posted on Wednesday, October 29, 2008 at 4:04 am and is filed under Music Reviews with tags Black Milk, Detroit Hip-Hop, Fat Beats, Hip-Hop, Tronic. You can follow any responses to this entry through the RSS 2.0 feed. You can leave a response, or trackback from your own site.